A significant milestone in the construction of 82045 was reached this month when the smokebox saddle was delivered from Dudley on 12th August. It is now painted and fitted into the chassis together with the front stretcher which supports the pivot centre for the pony truck. This statement rather simplifies two days of very hard work (not without a little anxiety) for our team of volunteers (aka. the Monday gang). Thankfully all went remarkably well and we are very grateful for the assistance of Brian Malyon and the SVR’s JCB for the lifting movements required to manipulate this one and a half ton component into position. All the various holes in the sides of the saddle are now being drilled through the pre-drilled main frame plates with our magnetic base drill. 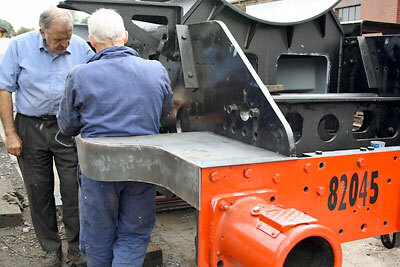 Just prior to the arrival of the smokebox saddle we prepared a drilled template from the main frame plates for eventual use in drilling the cylinders. With all the large components now installed between the frames the way is clear to turn our attention towards riveting the chassis. Inside the works Richard has been busy machining the backing plates for the manganese steel liners for the horn guides and blocks. A company in Dudley is laser cutting the manganese plates to size. Phil has provided his expert welding skills to the manufacture of the cross stays between the horn guides and blocks. These components will then move over to Richard for machining. Having manoeuvred the saddle so skillfully into position with the JCB, Brian Malyon has now kindly given up some of his free time to producing the front footplating. Colin is poised with a brush and pot of BR Green paint to add a flourish! 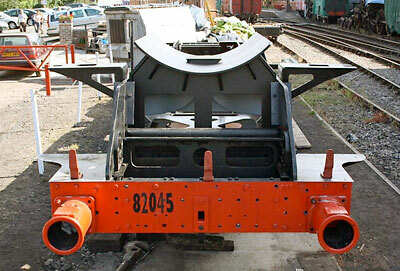 Whilst this work may not be considered essential at the present time it was felt that a more complete appearance to the front of the loco would be beneficial. 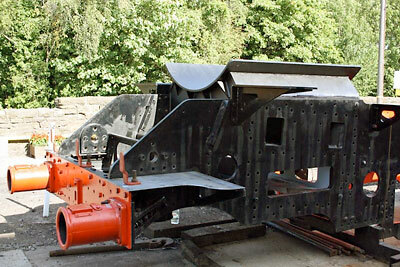 82045 is now beginning to look like a locomotive instead of a huge Meccano set! 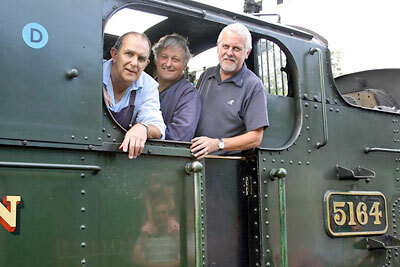 Subject to confirmation, we hope to hold the Second Annual General Meeting of the 82045 SLT in the upstairs lecture theatre at Kidderminster Railway Museum at 2.30pm on Saturday 31st March 2012. This date will be confirmed as soon as possible. We hope for a good turnout again - there will be a lot to tell you and discuss with you, but we promise not to make it too long-winded! The latest issue of Heritage Railway featured a full-page advertisement and a substantial piece about 82045 in the magazine's News section. Response so far has been good, with several new life members and a number of new monthly standing orders. The magazine appeal was directed towards the wheels, and a number of supporters specified that they wished their donations to be ring-fenced to this effect. Many thanks to all who have responded to the wheel appeal. 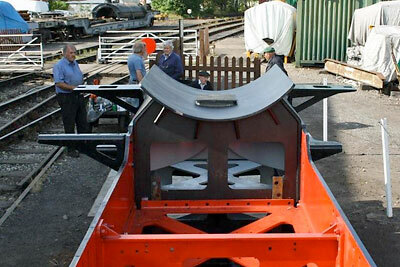 To the wider readership, please consider supporting the 82045 Wheel Appeal. We estimate that we need to raise about £150,000 in all and hope to achieve this within the next two and a half years, though we are not underestimating the magnitude of the fund-raising job. As soon as the cylinder assemblies are completed and funds are in place for the first stage of what can be described as Phase Two of the project - Phase Three being the boiler and firebox - work will commence on wheeling the chassis. Just a reminder that the team will be attending the SVR Peep Behind the Scenes weekend, 3rd & 4th September, and the Autumn Steam Gala, 23rd to 25th September, with sales stands at both Bridgnorth and at Kidderminster. We look forward to meeting you there! Last month we introduced a new easy way of donating to 82045 by text message. The response has been good but these donations are anonymous to us. We wish therefore to thank everyone who has donated in this way. The new footplating ready for a lick of green paint! All photos by Tony Massau. The 82045 Spring raffle was won by Steve Goodwin this year. As Tony and Chris had done their week of crewing, driver Rod Derry and fireman Steve Jones helped us out by taking Steve on a return journey on 5164. Steve had a great day - the smiles say it all. And it could be you next year!